This Exercise is intended to add proprioceptive challenges to the segmental movement of the spine in the bridge. 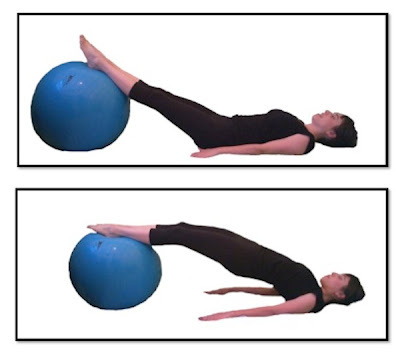 The ball can be a very telling tool when it comes to imbalances of the spine. It can let you know if you have a tendency to put weight in one foot more than the other. It can tell you where there might be rotations in the spine. As you are doing this exercise use this information to your advantage. If you notice the ball rolling to one side as you do this exercise try to use the opposite leg to pull it back. If you feel one side of your spine a little bit more than the other, then concentrate on rolling down your spine feeling both sides of the spine evenly as they move.